At last, it dawned on George Koch why people come from all over the world to ski the off-piste-only terrain at Silverton Mountain. 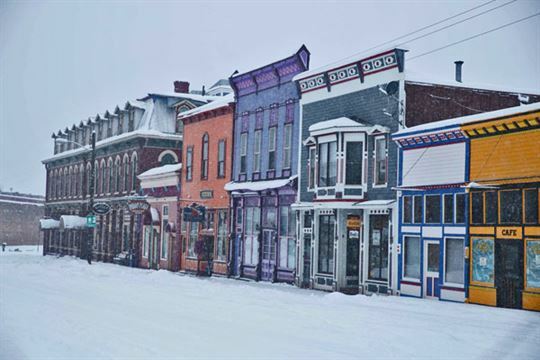 Sliding through the icy main intersection in tiny Ridgway, Colorado, the county sheriff shook his head, our epic five-resort Ski Canada road trip nearly came to an end. Luckily the dark crossroads was empty, we slid on through unharmed, and the near-mishap happened after successfully navigating Colorado’s fearsome, over 3,300-metre-high Red Mountain Pass, or we might have never set out in the blizzard. Silverton, at 10,000 feet, is one of Colorado’s best-preserved Gold Rush-era mining towns. 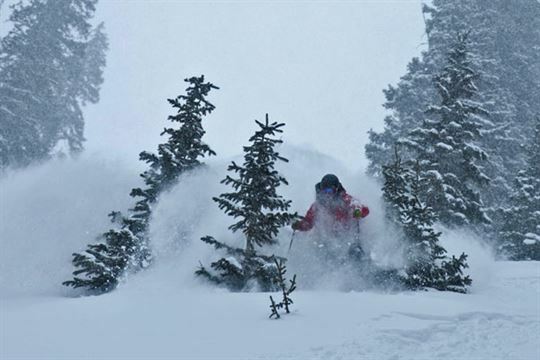 The trip had flipped in a seeming eye-blink from the famine of a month-long snow drought, with Colorado’s ski areas little more than boneyards, to the feast of a multi-day season-setting storm. That it happened at Silverton Mountain was even better. Silverton guide Calvin working hard to earn his day’s wage. The Ski Canada team — photographer Scott Smith, athlete Claire Challen and me — got to explore the incredible steep avalanche gullies and open bowls of this gigantic, off-piste-only, single-chairlift mountain with resort co-owner Jen Brill as the blizzard delivered an inch of powder every hour. 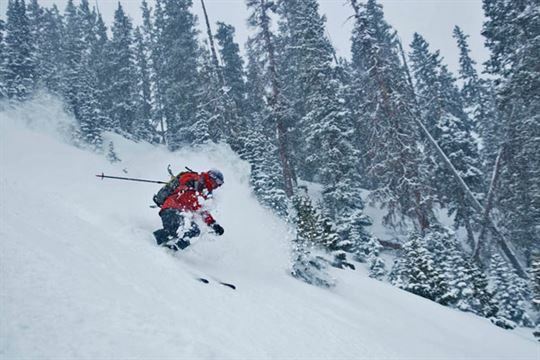 Look for the trip wrap-up in a few days, and see the full story in next season’s Ski Canada. 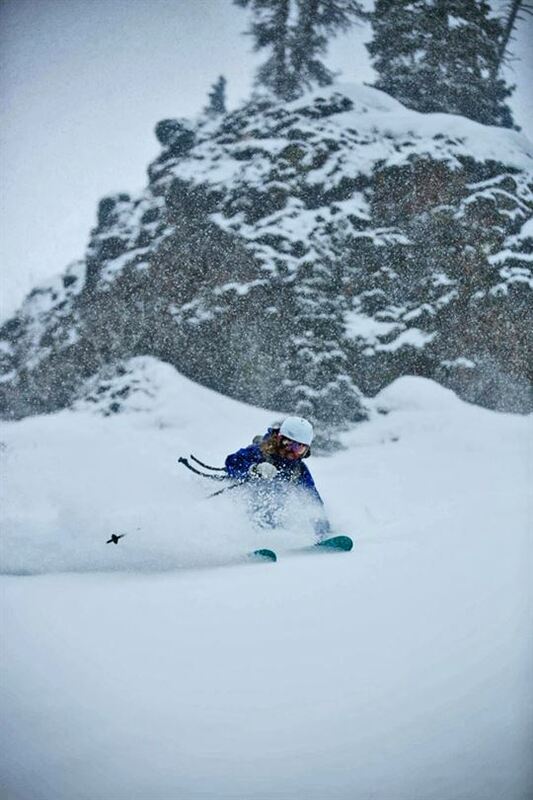 Ski Canada contributor and pro skier Claire Challen smiling her way through an inch-an-hour Colorado blizzard. 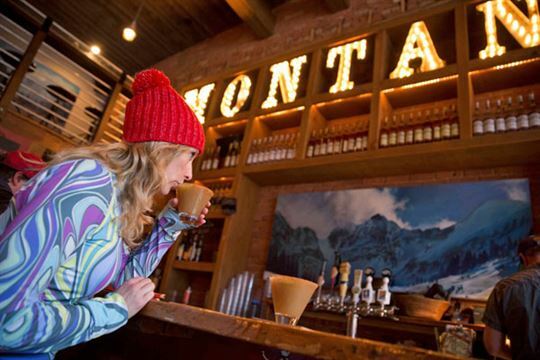 The Montanya Bar in Silverton specializes in dozens of rum-based drinks, of which Claire, alas, had time for only two.